Pat Bells Station is music made simple and fun. No more broken strings, and no tuning required. Simply pat the bells, secured on a wooden station, for vibrant and colorful notes! This 5 Bell Set includes five bells arranged in a pentatonic scale, a scale complete in tonality. Because of this, every melody played is guaranteed to sound as harmonious, with no discordant or jarring combinations. Complete with a songbook and sheets of color-coded stickers, used to record new melodies in a proven visual method to be effective. 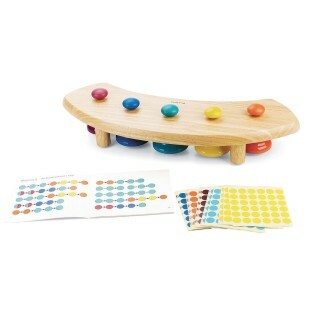 Also includes a set of hand-picked, introductory rhythms that boost creativity to start anyone on a musical journey.